Serpent Mound Park Manager Tim Goodwin invites the public to attend Archaeology Day 2015 on Saturday, Sept. 12. Visitors will explore Ohio's ancient Native American legacies through archaeological presentations and many displays of artifacts left behind by native cultures. Admission is free with an $8 parking fee per vehicle. For details, see www.arcofappalachia.org (Click on Events), or call Serpent Mound at 1-800-752-2757. The park is located at 3850 S.R. 73, Peebles, just a few miles from the Highland/Adams County line. 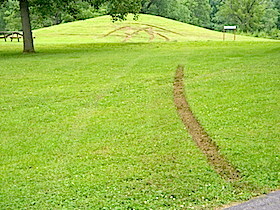 LOUDEN – The Adams County Sheriff’s Office is investigating property damage that occurred over the Fourth of July weekend at Serpent Mound off state Route 73. Serpent Mound is an internationally known National Historic Landmark built by the ancient cultures of Ohio. Park Manager Tim Goodwin told The Highland County Press on Sunday, July 5 that sometime between 7:30 p.m. Saturday, July 4 and 8:45 a.m. Sunday, July 5, someone drove a vehicle – possibly a pickup truck – over a burial mound and through a wooded area that is off limits to cars and trucks. Goodwin said the Adams County Sheriff’s Office is investigating the incident. The recent installation of security cameras within the park should help in the investigation, Goodwin said. Anyone with information should call the Adams County Sheriff’s Office at (937) 544-2314. 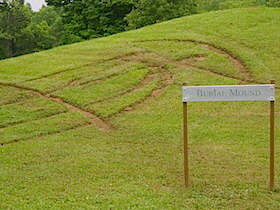 Serpent Mound is an effigy mound (a mound in the shape of an animal) representing a snake with a curled tail. There are three burial mounds – two created by the Adena Culture (800 BC-100 AD), and one by the Fort Ancient Culture (1000-1650 AD) – within the park. According to the park’s website, “In the late 19th century, Harvard University archaeologist Frederic Ward Putnam excavated Serpent Mound, but he found no artifacts in the Serpent that might allow archaeologists to assign it to a particular culture. Based largely on the nearby presence of Adena burial mounds, later archaeologists attributed the effigy to the Adena culture that flourished from 800 B.C. to A.D. 100. This theory on the site’s origin was accepted until a 1991 site excavation used radiocarbon dating to determine that the mound was approximately 900 years old. This would suggest the builders of the Serpent belonged to the Fort Ancient culture (A.D. 1000-1500). In 2014, another team of archaeologists presented new radiocarbon dates for the Serpent suggesting it was built by the Adena culture at around 300 B.C. The significance of Serpent Mound and other ancient Ohio earthworks has garnered international attention. In 2008, Serpent Mound and eight other Ohio earthworks were selected by the United States Department of the Interior for inclusion on the United States’ Tentative List of sites to be submitted to United Nations Educational, Scientific, and Cultural Organization for inscription on the prestigious World Heritage List. For more information, go to https://www.ohiohistory.org/visit/museum-and-site-locator/serpent-mound. My Great Uncle Daniel Wallace own the land when the mounds were discovered. His children were born in the house that use to stand on the grounds This comment has been hidden due to low approval. Been there, Richard, and the Beekman Arms is the same family. I don't know where you are in Florida, but if you run into any Beekmans from Clearwater to Orlando to St. Cloud, it is likely they are my first cousins or their offspring. Most of Mother's siblings moved there in the sixties. This comment has been hidden due to low approval. Since Jim Thompson brought up the name Beekman I will add a comment. I have moved to Florida about a month ago, But lived in a small upstate New York town called Rhinebeck and the center of town was a hotel called "The Beekman Arms". It is the oldest still operating Inn in America and was constructed on the early postal route from NYC to Albany, now called the Albany Post Rd. And Stuyvesant was listed as one of the early owners as his family residence. Behind it is an antique dealer in what use to be the barn and carriage house for travelers. This comment has been hidden due to low approval. I think all of us Beekman descendants in Southern Ohio are related. We had some relatives come to Ohio, Portsmouth, specifically in the late 1790s via Virginia. We are related to all the Beekmans in New York and all things named Beekman in New York were named for our ancestor who came over with Peter Stuyvesant. I think he was old Peter's bag carrier. This comment has been hidden due to low approval. JT are you related to Blain Beekman of Waverly Ohio? This comment has been hidden due to low approval. All I know is my Grandfather Beekman said when he was a boy in the 1890s he would go out to Serpent Mound to his grandfather's old farm where he raised corn on that site. This comment has been hidden due to low approval. Please elaborate. Us true historians of these sites resent salting to confuse the historical context. Quite possibly your family was responsible for the confusion if it was an Adena site or Fort Ancient site as has been noted. One of my friends has a Phd in archeology and in the past has been the archeology Leader of our state. Your information needs to be taken into consideration, please contribute, negative or positive. This comment has been hidden due to low approval. Yes Jim, I have read where both Serpent Mound and Seip Mound (Bainbridge) were rebuilt right after the good scholars studied them. I don't know why a reconstruction took place. To me, the mounds kinda lose their authenticity. I still find the mystery behind Serpent Mound very interesting. Who built it and why? I visited Fort Hill this spring. I have the same questions there. This comment has been hidden due to low approval. My great great grandfather, as the family legend goes, used to farm Serpent Mound when it was not as distinctive as it is now. I have always wondered about how much in the way of relics is in the top ten feet of soil. It seems as though it may have been "enhanced" at one point or other if the family legend is true. This comment has been hidden due to low approval. Someone should be horsewhipped over this one. So disrespectful. This comment has been hidden due to low approval.